When Ludovic Huraux started his first company in 2007, he had no technical skills, no marketing background and no source of funding. He was 25 and leaving a cushy finance job to become a first-time entrepreneur. With no startup experience, Huraux launched Attractive World, a dating site that grew to produce one wedding a day. He was competing with industry giants, but scaled the business to be profitable and the most well-known premium-dating site in France. The thing that made Huraux successful was his love of meeting new people and learning from them. And that’s what his new project is about – Shapr is a free networking app to meet the people you actually need to meet to help advance your career. intended to make networking easy. Using the 10 interests you select such as #marketing or #entrepreneurship, your location, and your industry, Shapr curates a daily batch of 10 to 15 nearby professionals who share your passions and goals. You swipe on those you hope to meet and get notified when there is mutual interest to have a conversation. The app takes less than two minutes a day to use and has initiated more than 4 million professional conversations so far this year. Already, 600,000 users have signed up including high-level CEOs and senior professionals, and also professionals exploring career changes, launching side projects and building fresh networks in a new city. Every person benefits from meeting new people. On Shapr, you’re introduced to those who share your interests but not necessarily your circles. It’s an easy way to start a conversation with people who intrigue you, who are different from you, and who can help you figure out your own path. When asked about the biggest challenge of building Shapr, Huraux shares that it’s convincing people that everyday networking is and should be the new normal. “We have to persuade professionals that meeting new people regularly should be a habit,” he says “It’s not only the way to succeed in your career, but also the way to live a happy life. 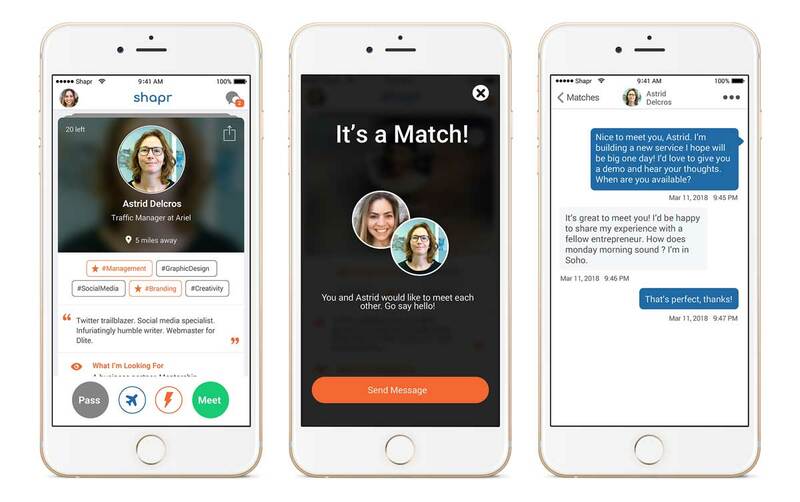 Ten years ago, people were adjusting to the idea of meeting romantic connections on an app, and now it’s the normal way to date. We want to do the same with networking. Shapr is free for iOS and Android. Get it here.